[An English stage showing Sir John Falstaff and Mrs. Quickly in the foreground] [graphic]. 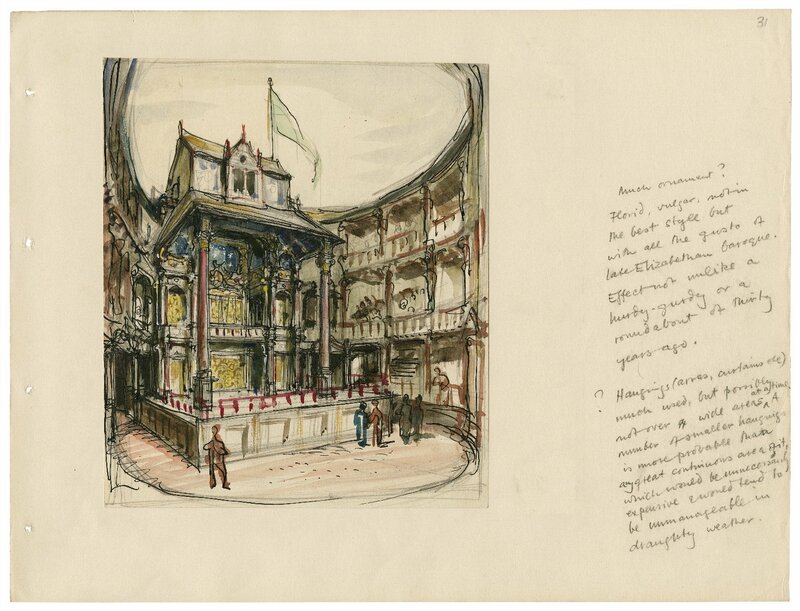 In Shakespeare's time, a stage wasn't just one type of space; plays had to be versatile. The same play might be produced in an outdoor playhouse, an indoor theater, a royal palace—or, for a company on tour, the courtyard of an inn. In any of these settings, men and boys played all the characters, male and female; acting in Renaissance England was an exclusively male profession. Audiences had their favorite performers, looked forward to hearing music with the productions, and relished the luxurious costumes of the leading characters. The stage itself was relatively bare. For the most part, playwrights used vivid words instead of scenery to picture the scene onstage. In 1576, when Shakespeare was still a 12-year-old in Stratford, James Burbage built the Theatre just outside London. The Theatre was among the first playhouses in England since Roman times. Like the many other playhouses that followed, it was a multi-sided structure with a central, uncovered "yard" surrounded by three tiers of covered seating and a bare, raised stage at one end of the yard. Spectators could pay for seating at multiple price levels; those with the cheapest tickets simply stood for the length of the plays. Shakespeare's company, the Lord Chamberlain's Men, was one of several to perform at the Theatre, appearing there by about 1594. A few years later, the Burbages lost their lease on the Theatre site and began construction of a new, larger playhouse, the Globe, just south of the Thames. To pay for it, they shared the lease with the five partners (called actor-sharers) in the Lord Chamberlain's company, including Shakespeare. The Globe, which opened in 1599, became the playhouse where audiences first saw some of Shakespeare's best-known plays. In 1613, it burned to the ground when the roof caught fire during a performance of Shakespeare's Henry VIII. A new, second Globe was quickly built on the same site, opening in 1614. Large open playhouses like the Globe are marvelous in the right weather, but indoor theaters can operate year-round, out of the sun, wind, and rain. They also offer a more intimate setting with the use of artificial light. Shakespeare's company planned for years to operate its own indoor theater, a goal that was finally achieved in 1609 when the Burbages took over London's Blackfriars theater. Still more indoor productions often came during the period between Christmas and New Year, and at Shrovetide (the period before Lent) at one of the royal palaces, where Shakespeare's company and other leading companies gave command performances—a high honor that was also well-paid. Playgoers in Shakespeare's day paid a penny to stand in the uncovered yard of a playhouse, or two pennies for a balcony seat. (It’s hard to find exact comparisons to what a penny then is worth now, but a day’s worth of food and drink for a grown man would have cost about fourpence.) Indoor theaters like the Blackfriars accommodated fewer people and cost more, with basic tickets starting at sixpence. Fashionable men about town could get a seat on the side of the stage for two shillings (24 pence). Spectators liked to drink wine or ale and snack on a variety of foods as they watched the plays—modern-day excavations at the playhouses have turned up bottles, spoons, oyster shells, and the remnants of many fruits and nuts. While most women's roles were played by boys or young men in the all-male casts, comic female parts such as Juliet's Nurse might be reserved for a popular adult comic actor, or clown. In addition to their dramatic talents, actors in Shakespeare's time had to fence onstage with great skill, sing songs or play instruments included in the plays, and perform the vigorously athletic dances of their day. Actors usually did not aim for historically accurate costumes, although an occasional toga may have appeared for a Roman play. Instead, they typically wore gorgeous modern dress, especially for the leading parts. Costumes, a major investment for an acting company, provided the essential "spectacle" of the plays and were often second-hand clothes once owned and worn by real-life nobles. The bare stages of Shakespeare's day had little or no scenery except for objects required by the plot, like a throne, a grave, or a bed. Exits and entrances were in plain view of the audience, but they included some vertical options: actors could descend from the "heavens" above the stage or enter and exit from the "hell" below through a trapdoor. Characters described as talking from "above" might appear in galleries midway between the stage and the heavens. 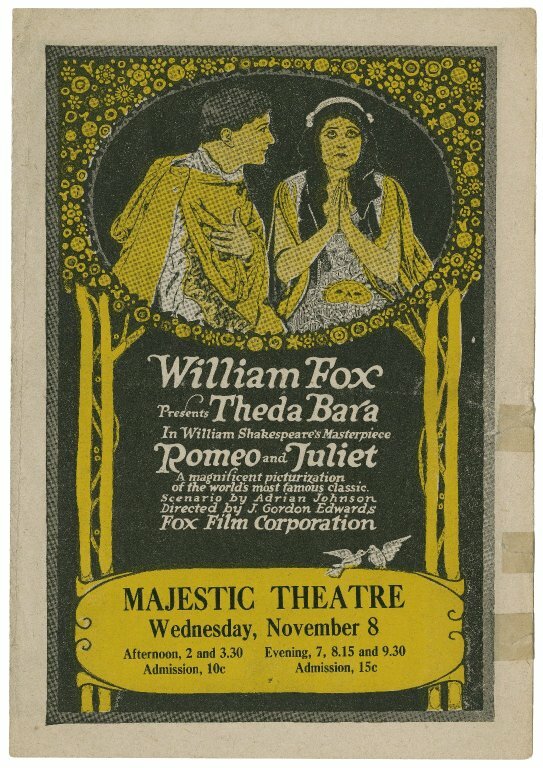 William Fox presents Theda Bara in William Shakespeare’s masterpiece Romeo and Juliet. In 1642, the English playhouses and theaters were closed down (and often dismantled for building materials) as the English Civil War began. With the restoration of the English monarchy in 1660, theater returned—as did Shakespeare's plays, now with both male and female performers. The first recorded performance of an actress occurred in December 1660, although we're not sure of her name; she appeared as Desdemona in Othello. In the centuries that followed, Shakespeare's plays have been performed in England, North America, and around the world, in productions that mirror the state of theater in each place and time: from lavish scenes, to surrealism, to stark bare stages. They have been used as a medium for political commentary, and have been incorporated into theatrical traditions like Japanese Kabuki theater. Beginning in the late 1800s, Shakespeare's plays inspired the creation of a wealth of replica Elizabethan theaters, more or less faithful to what was known of the theatrical past. Dozens of open-air Shakespeare festivals have also grown up across the United States and other countries.Shakespeare's works have also been frequently interpreted on film. Brooklyn's Vitagraph Company, for one, produced several silent, one-reel movies of the plays starting in 1908. Since then, literally hundreds of Shakespeare films—including works like Baz Luhrmann's Romeo + Juliet (1996)—have appeared, opening a new, cinematic stage for Shakespeare's words.